SportsWiseGuy.com: Jon Lester: Not Your Average Major Leaguer. Jon Lester: Not Your Average Major Leaguer. At the time it seemed like a given that the Red Sox brass would jump at the opportunity to lock him up as quickly as possible. Their pitcher stated, “These guys are my number one priority… I understand to stay here, you’re not going to get a free agent deal. You’re not going to do it. It’s not possible. You’re bidding against one team. I understand you’re going to take a discount to stay,” Lester told reporters at the annual Baseball Writers of America awards ceremony dinner. “Do I want to do that? Absolutely. But just like they (the Red Sox) want it to be fair for them, I want it to be fair for me and my family. If we can get to something in spring training, that would be awesome…” All quotes are courtesy of the Boston Globe. As I wrote then, Lester was going above and beyond what 95-97% of any other MLB players would do by saying those words. His only (very simple) request was to get something done before the season began. If not, he told reporters that he would prefer it be put off until after the season so it would not be a distraction to the team. Now in late July, approaching the non-waiver July 31st trade deadline, Lester has done anything but let his impending free agency become a distraction. Despite a borderline slap-in-the-face 4 year, $70 million offer, Lester has been more dominant in 2014 than in any other regular season. In 20 starts he has compiled a 2.50 ERA (3rd in the American League), 1.14 WHIP (career best), 142 strikeouts (top-10 in MLB) to just 31 walks (a career best 4.6 K/BB, 2. 0 per 9 innings). He has surrendered only 8 home runs in 137 innings pitched. His success earned him his third American League All-Star selection, the first time since 2011. After 8 shutout innings and a win against the Kansas City Royals, Lester has surrendered 2 earned runs or less in a remarkable 14 of 20 starts. This does not completely demonstrate exactly how dominant he has been in 2014. How can anyone say that? Consider this: Lester has had two poor starts all year (5/22 vs. Toronto, 6/7 @ Detroit) in which he allowed 22 hits, 12 earned runs, 3 walks, 3 strikeouts and 5 home runs across 10 1/3 innings pitched. Yes, of course those starts are still there. However, the larger sample size of his other 18 starts demonstrate exactly how dominant the 30 year-old impending free agent has been for an offensively starved Red Sox team. In those 18 starts, Lester has thrown 125 1/3 innings, allowed 100 hits, 26 earned runs, 139 K’s to 28 walks, while allowing only 3 home runs. That equates to a 1.86 ERA, 1.02 WHIP, 9.98 K’s per 9 innings, 2.0 BB/9, 7.1 H/9, 0.2 HR/9. In a year where Felix Hernandez and Chris Sale are not pitching to their own career bests, Lester is probably your leading candidate for the American League Cy-Young Award with roughly ten weeks left in the regular season. His 10-7 record does not tell the story: his offense has given him only 3.35 runs of support per start. Only 11 MLB starting pitchers have received less run support. Despite that, it is overwhelmingly likely that he finishes 2014 with his sixth 15+ win season out of seven as a full time starter. When writing about his contract negotiations in late January (here:http://scottjronsports.wordpress.com/2014/01/24/jon-lester-not-your-average-major-leaguer/), I made the comparison to Philadelphia Phillies left-hander Cole Hamels’ contract of 6 years, $144 million, which he signed at age 28 in July 2012. Those comparisons ended up dead on after the Boston media began comparing Lester’s career statistics to Hamels’ prior to the All-Star break. Even more ironically, national pundits reported the Red Sox were scouting Hamels. After this season, the 2008 World Series MVP for Philadelphia will be due 4 years, $90 million on the contract he signed in 2012. The unsuccessful free agent contracts of both Adrian Gonzalez and Carl Crawford before the 2011 season caused a shift in the front office philosophy of the team. Since those failed signings and their subsequent departure in the biggest salary dump Major League Baseball has ever seen, the Boston front office has committed not to pay over 5 years for players. Often this has meant paying a large average annual value in order to get the player signed. At age 30 Lester is looking for his only long term, big money contract over the course of his career. The safe assumption is, since he wants to remain in Boston for his career, that he probably wants a 6 year deal. He may even settle on a 5 year contract, but he undoubtedly no longer will accept a hometown discount. Earlier in the season more than one report came out about other players being upset about the initial offer that Lester received. Much to his credit (and to no one’s surprise), the prized pitcher has handled the situation perfectly. He has answered every question without making it about himself. He has gone out to the mound, and given the team his absolute best, with consistently excellent efforts through the first three and a half months of the season. Durability is never in doubt with him either. In a baseball era where torn ulnar collateral elbow ligaments have resulted in so many Tommy John surgeries it’s been deemed an “epidemic,” Lester has proven to be among the most durable starting pitchers in baseball. He’s well on his way to 32 or 33 starts, a number he’s hit in five of his first six seasons (with 31 in the other). He’s thrown at least 200 innings in five of the last six seasons. He has only been to the 15-day Disabled List one time in his career, missing two starts in 2011 with a minor lat tweak. Essentially there is zero doubt that Lester has greatly increased his value this season. Now more than ever, there is a real possibility that Boston will lose their best pitcher. There is no real argument, the Red Sox must swallow their pride to keep him. With Philadelphia recently deeming that Hamels is not available for trade, it would cost Boston at least a trio of very good prospects to pry him away from the Phillies. With so many young pitchers on the way to the big league club in the next 1-3 years, who better to mentor them than Lester? With the way he’s pitched this season (and while Hamels missed the first month with a shoulder issue), the realization that they cannot afford to lose their 2002 2nd-round pick has come full circle to Boston GM Ben Cherington and President Larry Lucchino. With so many young pitching prospects on their way up, it only makes sense that Lester is the guy who can teach them the most about being a successful big league starter. The last thing the Red Sox should be trying to do is cheap out on a guy who has been integral in two World Series Championships, particularly in 2013. They undoubtedly know that they made a huge error in judgment this spring, and the ball is now firmly in the burly hurler’s court. Lester has said that he does not like change, that this is the place he wants to be. That is the one mistake he has made in this entire drawn out process. Yes, it is the best thing any fan of the team and player could hope for him to say. However, he initially took all of the leverage away from himself. He knew that at the time for sure. After the borderline ridiculous/nearly insulting proposal, added to the fact he has pitched lights-out baseball, he has unquestionably regained that leverage and then some. At this point, on July 20th, it appears as though his patience and resistance to change will continue to be heavily tested. 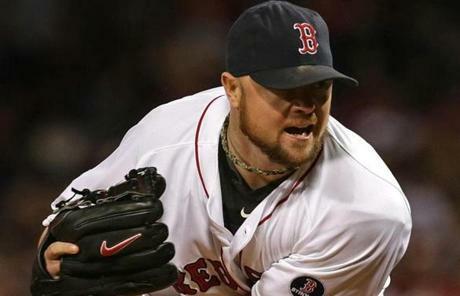 What is now clear to observers, and Red Sox Nation alike, is that the team owes this one to Jon Lester. They need to come to him with their tails between their legs, admit they wronged him with the first offer, and give him what he’s earned over the course of his career. The hometown discount that he was talking about? It appears all but certain that is no longer an option for the Boston Red Sox.